1. The removal of insects (as from an aircraft). 2. Spraying aircraft for insects, a procedure called disinsection. 3. Freeing any area from insects. Some countries in Africa, Latin America, the Caribbean, Australia, and the South Pacific require the spraying of aircraft passenger compartments with insecticide while passengers are present. This is done to prevent the importation of insects; such as, mosquitos. Disinsection procedures have been determined to be safe by the World Health Organization (WHO); however, they may aggravate allergies for some passengers. 1. To separate into its component parts or particles; to reduce to fragments, to break up, to destroy the cohesion or integrity of (as with a mechanical or an atmospheric action): "The Twin Towers in New York City were disintegrated by a terrorist attack on September 11, 2001." A reference to that which has been reduced to fragments, broken up; or broken off as fragments. A lack of integrity or completeness; an unsound condition. Reduction to component particles, breaking up; destruction of cohesion. 1. To dig up or to remove from a grave or a tomb; to exhume: In the detective story Jenny was reading, Mabel, the leading character, was disinterred in order to have her body re-examined to find out what what really caused her death. 2. To bring to public notice; to disclose: Janice was able to disinter an ancient document about Julius Caesar that has been missing from public knowledge for centuries. © ALL rights are reserved. 1. Having no concern regarding a result: Since the judge stands to profit from the sale of the company, he can't be considered a disinterested person in this legal dispute. 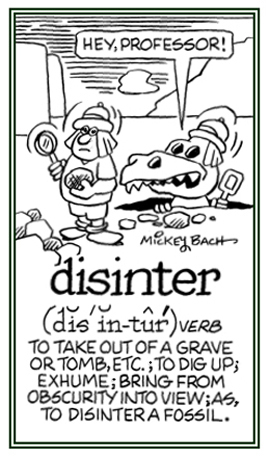 Despite critical disapproval, disinterested has come to be widely used by many educated writers to mean "uninterested" or "having lost interest". 2. Etymology: from Latin dis-, "not, without" + interested, "it matters"; frominteresse, literally, "to be in the middle", from esse, "to be". The act of digging up something; especially, a corpse that has been buried. 1. To undo the joining of something; to separate; to detach. 2. To disconnect parts, things, or ideas, or to become disconnected. 3. To separate or to disconnect, or to become separated or disconnected. 1. To separate something at the joints, or to come apart at the joints; to dislocate. 2. To force or to move something out of its usual position, or be moved out of the usual position. 3. To destroy the unity or coherence of something. 4. To cease or to break an association with someone or something: "He is disjointing himself from the organization because he realizes that it is advocating illegal procedures." 5. To disarticulate or to separate bones from their natural positions in a joint. Characteristic of a broken association with someone or something, or that which has become dislocated. 1. Discontinuous or separated in time or space. 2. Consecutive musical notes that are separated by an interval of a second. 3. Having deep constrictions separating the head, thorax, and abdomen; as with insects. Showing page 17 out of 35 pages of 513 main-word entries or main-word-entry groups.